In July 2017, our Dr. Alan J. Micev interviewed his good friend and colleague Dr. Hasham Alvi. Dr. Alvi is a hip and knee replacement surgeon at Barrington Orthopedic Specialists in Chicago, Illinois. They sat down to have a discussion about common myths and misconceptions about the operating room. Please enjoy this podcast and feel free to leave comments. 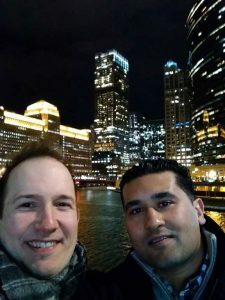 Dr. Micev (left) and Dr. Alvi (right) pictured here on a cold January night on the Chicago river.